Step (don’t hop) forward with your better foot with your toes landing in the center of the imaginary square of the walker’s 4 legs. Your walker should be adjusted to the proper height for you, so that you get the best leverage when using it. If your walker is too low, you’ll have to bend over to reach the handles and you won’t have good posture or leverage. On the other hand, if your walker is too high, you won’t be able to use your arms to support your body weight and you may not be able to walk as well. When you’re standing straight up and looking forward, adjust the walker so that the handles are level with your wrists. Having the handles at the wrists gives you the most leverage so you can maintain your non-weight bearing status and stand up as straight as possible. Not only is having the right height important but positioning the walker correctly is just as important. When the walker is in the right position it’ll be easier to keep your balance. And that’s important when you only have one leg you can use. Many healthcare professionals will tell you that you need to “stand inside” the walker. While this advice may be well intentioned, it’s generally a misconception. Whenever you’re using a walker, you’ll want to stand so that your hands are in front of your thighs or hips and not “at the side” of your hips. This position will usually put your toes either in the center of the imaginary square made by the walker’s 4 legs, or slightly behind the walker’s back legs. I point this out because when a person stands “inside” the walker, they are usually so close the the front cross bar and their hands at their side that they have to bend forward to keep their balance. This promotes poor posture and throws your balance backwards making you less stable. With the best positioning of the walker, a person’s hands will always be in forward of their hips. Whether at rest and standing straight, or when walking, having the hands in front of the hips gives you the best support. Now, with your toes at rest in the center of the imaginary square or retangle made by the walker legs, push the walker forward about a step length. Now, lean your body weight onto your arms at this point and use them to support your body weight, since you’re “non-weight bearing” and have to keep one leg in the air. Then step, not hop, forward with your good foot coming to rest in the center of the imaginary square. The step should be an easy and graceful move rather than a quick hop that has more impact and may throw you off balance. The video below shows you how some use a walker when they are non-weight bearing on one of their legs. 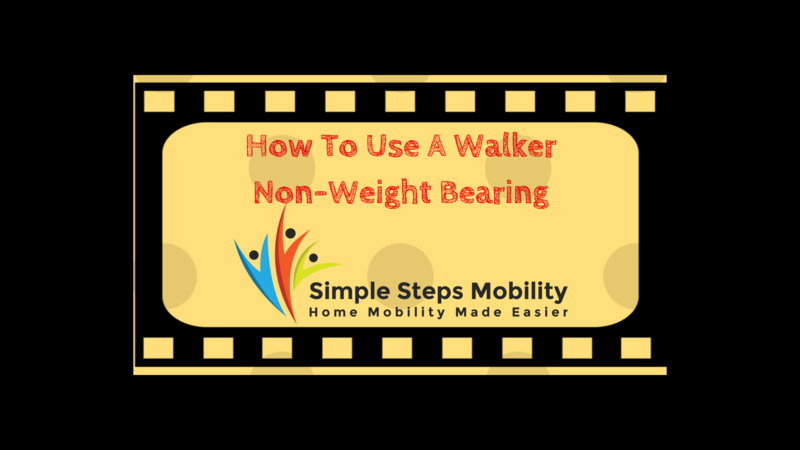 Remembering this along with the importance of proper walker height and walker positioning, are simple steps to using a walker non-weight bearing.